After coming across the following questions, Origin of “All right, what's all this, then? !” and Origin of “Well, well, well. What do we have here?”, my curiosity was piqued to try and discover the origins of "it's a fair cop". a phrase roughly meaning "Eh, I guess it's fair." • It's a fair cop - honest, officer! • And criminals are warned that from then, they won't even have time to tell police it's a fair cop. • Do you want me to say that it's a fair cop or something? From a Q&A on worldwide words discussing the phrase. A: It’s a well-understood British expression, though it has been used so often in second-rate detective stories and police television series down the decades that it has long since ceased to be possible to use it seriously (the Monty Python team was playing on its clichéd status). It comes from the same root as the term cop for a policeman. This may be from the slang verb cop, meaning to seize, originally a dialect term of northern England that by the beginning of the nineteenth century was known throughout the country. This can be followed back through French caper to Latin capere, to seize or take, from which we also get our capture. (See also the piece on cop, a policeman.) So a cop in this sense was an example of a seizure or capture. It’s a fair cop was what the essentially good-natured thief with a typically British sense of fair play was supposed to say as his collar was fingered by the fuzz, meaning that the arrest was reasonable and that he really had done what he was accused of doing. You will understand that this is, and always has been, an entirely fictitious view of the relationship between British criminals and the police. This answers the "cop" part, but doesn't delve into the "fair" component of the expression and the concurrent use of the words. I understand the meanings of "fair" and "cop"! I'd like to know when and how the words came to be paired together. Researching "fair cop" in the Online Etymology Dictionary didn't get me very far. "policeman," 1859, abbreviation (said to be originally thieves' slang) of earlier copper (n.2), which is attested from 1846, agent noun from cop (v.) "to capture or arrest as a prisoner." Cop-shop "police station" is attested from 1941. The children's game of cops and robbers is attested from 1900. The phrase goes back to the 19th century. Popularized by the novel Raffles, 1899. Can anyone corroborate and expand on this? any situation seen as fair and about which there is no complaint. "Several other witnesses gave corroborative evidence, and a constable who helped to arrest the prisoners stated that one of them, on being taken into custody, said: 'Ah, well, this is a fair cop.'" The verb cop meaning to catch comes from northern English dialect cap meaning to capture or arrest. This probably goes back to Latin capere to take or seize. So a copper was a catcher which is why it became an informal term for a police officer in the 1840s. According to the Oxford English Dictionary, "cop" in this sense means capture. Well, you have made a fair cop (capture) and I'll act square. 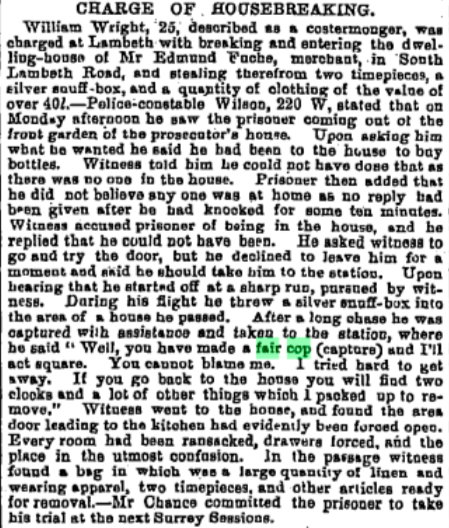 Another early example is in the Derby Mercury (Derby, England), Wednesday, March 27, 1878, which describes a guy who put two fouls in his pockets and got caught. The article says he called it a "fair cop" (here's a screenshot of the article). What do you want to search me for? You have got a good cop. Prisoner remarked it was ‘a fair cop’. If the Cruel Stork should come, He'd Tyrannize and Cop up some [Frogs]. As for where the verb cop came from, the OED thinks it's "[p]erhaps a broad pronunciation of cap" (a now-obsolete verb meaning "arrest" that itself is "apparently [from] Old French cape-r [meaning] to seize"). "It is a fair cop," admitted Mr John Rose, when discovered in company with a jemmy in a house to which he had not been invited ; "but I did not mean to get into the house ; I meant the pawnshop next door." There is an engaging frankness about the explanation. Inspector Scott narrated the facts of the case; and evidence was given by P.C. Ferguson to the effect that on the morning of the day named, about ten minutes to ten, he saw some men loitering about the house. Suspecting something wrong, witness entered the house, and found a man with a pot of beer before him. Mrs Peacock came to the bar whilst witness was there, and when she saw him struck the pot of beer off the counter. The man remarked that there was no use telling a lie about it ; and when witness remarked that it was a fair cop Mrs Peacock appeared very much flurried. The defence was a total denial that the liquor in the pot was beer. Mrs Peacock deposed that the man who was alleged to have been drinking beer went in her husband's house and asked her for a pint of beer. Mrs Peacock said, Not likely, and the man then asked her for a drink of water, which she gave him. In answer to Inspector Scott, witness denied that the man gave her any money. It was true that Ferguson said to her, This is a fair cop, and she replied, I don't see how you can call it a fair cop giving a man a drink of water. The defendant also swore that the pot contained nothing but water, and his statement was corroborated by another witness, who saw the water drawn. Eventually, however, the Bench ordered an adjournment of the case, in order to secure the attendance of a witness whose evidence the police and the defence were anxious to obtain. In each instance, the phrase "It's a fair cop" seems to mean "It is a clear case of catching [someone] in the act of doing something illegal." Above are a couple of citations showing early use of the phrase, without 'guv'nor. The sense of "fair" meant is "honourably, correctly". "Cop" in the phrase "a fair cop" is a noun related to the verb "cop" quoted above. But here it's a noun meaning the act of "copping", rather than meaning "someone who cops" by going from "to cop" to "copper" and then abbreviating back to "cop". It's the same as the way you can have "a walk", "a run", "a punch", "a murder", etc, only we don't really use "cop" as an independent verb anymore. Not the answer you're looking for? Browse other questions tagged etymology expressions british-english australian-english cliche . What is the origin of the word “copped”? Did Miranda cross the Atlantic? Is it “in” or “on” HNQ?